Here is a name you hear every now and then in magic history circles, Roterberg. For those who collect apparatus, you probably hear it more. But I decided to spend some time and find out exactly who this Roterberg fellow was and as I dug I discovered he had a very close relationship with Houdini. August Roterberg was born on April 5th 1867 in Hamburg Germany. He immigrated to the United States in 1882. 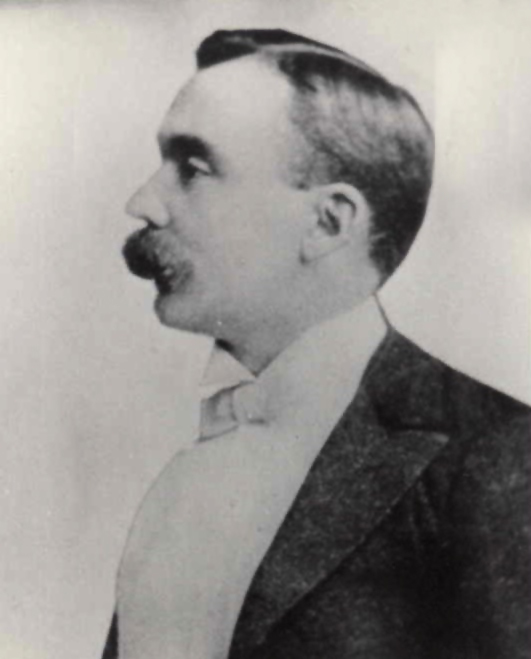 He married Anna Miller in 1894 and became a father in 1895 to twins, Hattie(Harriet) and Frederick. He opened his own magic manufacturing business which was located in several spots along Ontario Street in Chicago over the years and some say even had a store in the old Palmer House Hotel lobby. Houdini's first trip to Chicago was possibly during the 1893 World's Fair where he and Theo and Jacob Hyman performed. This is probably when Houdini first met August Roterberg, or Gus as he was often known. It's clear through the various letters sent between the two gentlemen that they were more than just acquaintances because one letter in particular mentions the death of Harry's brother William and also mentions his brother Leopold. In another letter to Bess, Harry mentions that he is going to have lunch at Roterbergs, which again signals a friendship beyond that of the typical magic dealer/patron. 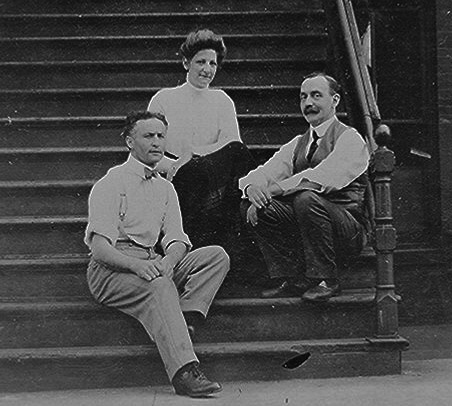 The photo above is of Houdini and the Roterbergs outside of their shop on 151 Ontario Street in Chicago. According to a couple newspaper accounts from 1897, Gus also started teaching lessons in sleight of hand to 'drummers'. But in the context of the article it sounded odd to me and then I discovered that 'drummer' was a slang term for traveling salesman. Gus Roterberg was known for making excellent magical apparatus and he clearly hired the best craftsman he could find. According to Milbourne Christopher's book The Illustrated History of Magic, Roterberg found out about a young man skilled in cabinet making and hired him to build wooden boxes. That young man was Henri Bouton, who would later change his name to Harry Blackstone. Also working in the shop, was Gus's son Frederick who would demonstrate items for customers and a young man named name George Wright. It turns out that young George Wright stumbled upon an ingenious method to make wooden balls appear and multiply. The story has it that Roterberg would often order wooden Ball Vases from Austria and on occasion the gimmicked piece would warp or become detached. 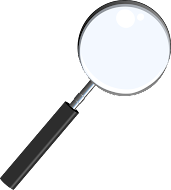 Roterberg instructed George Wright on what to do to fix them and one day quite by accident one of the shells from the gimmick fell upon one of the solid wooden balls. George messed around with it and eventually created what we know as the standard billiard ball production move. In time, Roterberg would sell this new creation at his shop and apparently this is how Roterberg has received credit for the creation of the Multiplying Billiard Balls, however, it was actually the invention of one of his employees. Roterberg is also credited with the invention of the Multiplying Thimble trick which could very well be true. 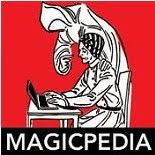 One thing he deserves great credit for is the publishing of magic books specifically for magicians. 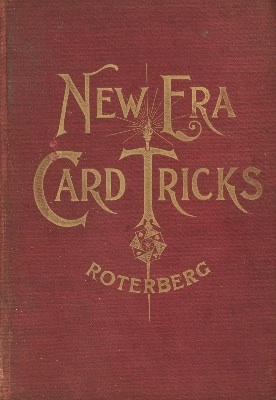 Today we have many magic publishers, but in the 1890s, Gus Roterberg was the first one printing books in English specifically for magicians only. His books include: The Modern Wizard (1895), Latter Day Tricks (1896), New Era Card Tricks (1897), and Card Tricks and How to Do Them (1902). In 1908, when Houdini decided to sell his Challenge Handcuff Act, he partnered with Gus Roterberg and Ralph Read to sell what would be called 'The Defiance Handcuff Act'. Roterberg would make all the special keys needed, and if I can read between the lines in their correspondence, may have also provided Houdini with keys that he needed on occasion. In Patrick Culliton's book, The KEY. According to Magicpedia, Roterberg sold his mail order business to Ralph Read in 1908 and then later sold the entire magic business in 1916 to Arthur and Carl Felsman when he was only 49. Looking at the US Census records I discovered Gus Roterberg started another business, a stationary store. His son Fred eventually took over the stationary store and Gus and Anna retired to Pasadena California where Gus died on September 23rd, 1928 at the age of 61 from natural causes. Anna moved back to Chicago and lived with Fred and his wife and Harriet and her daughter, for the rest of her life. I have a feeling there is more to be said about the friendship between Gus and Harry and I hope as time passes we are able to uncover more. This coming Sunday, Sept 23rd, marks the 84th Anniversary of the passing of August Roterberg. If anyone knows where Gus is buried, I'd appreciate it if you could pass that information on to me as I'd like to include his grave on my other site. I'm pretty certain he is buried in Chicago, but I've yet to find out where. 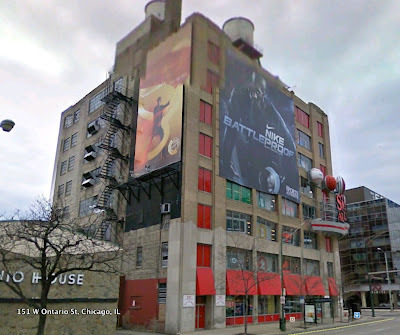 The location today of 151 W Ontario St, same place the photo at the top of the page was taken. Excellent work! Love that you found the location of the pic.